There are many places today that provide massage service and we realize that there are many options available. At Happy Buddha Foot Reflexology Spa, we pride ourselves in our excellent foot reflexology service with the highest attention to detail. 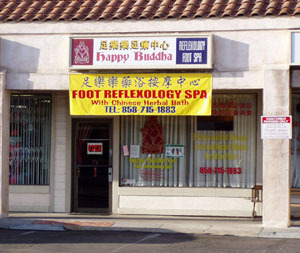 Happy Buddha is a place where you get reflexology treatment therapy, not just simply a massage. Our treatment therapy is based on Traditional Chinese Medicine, and based on Qi Meridian System. The combination of these two specialties is what makes our treatments different. The stress relief, relaxed tension, clearing of headaches, sinus pain, constipation, and many many more benefits happen every time. In addition, our California licensed massage therapists are your therapists. Their high level of training ensures that you receive beneficial treatments every time you come in. Every reflexology treatment will center on your needs, and what you need to have done at that time. 1) You are the most important to us. We customize every reflexology treatment to your needs. Whether you have a headache you want to get rid of, increase circulation to your body, relieve muscle tensions and fatigue, reduce sinus allergies, whatever your needs may be, that is our ultimate concern. 2) We care about our customers and we are passionate in what we do. 3) All therapists are California licensed massage therapists, ensuring that they do know and understand the Traditional Chinese Medicine, the meridian system and acupressure, and they are able to correctly treat the symptoms. 4) We have extended business hours to accomodate the busy working individuals. 5) We are available for walk-ins and appointments. Appointments are recommended, as sometimes the spa gets very busy and you may have to wait. 6) Our San Diego Spa offers special package. 7) Plenty of parking available in parking lots. Come in today and see for yourself why we are the best foot reflexology spa in town.